In the previous post, I shared my “dirty little secret” (aka my messy garage) as well as the cleanout process. While I included a helpful printable checklist to assist you in your own garage decluttering efforts, I couldn’t shake the feeling that something was missing from that post. Then, it occurred to me. Once you’ve decluttered your garage, you’ll need a way to effectively organize everything you need to put back. So, I designed these free printable garage bin labels for you. Enjoy! No garage? No problem! 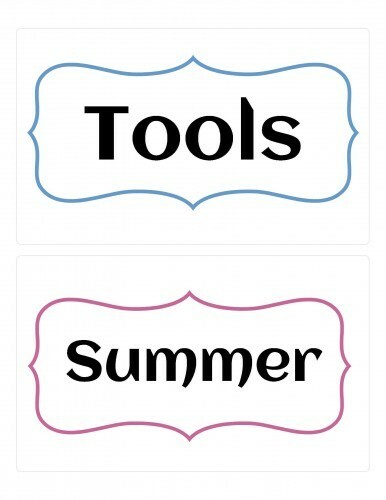 Use these labels to organize the bins in your basement, attic, or storage room instead. I designed these labels to print two per sheet on Avery (8126) white or Avery (5917) neon labels. Or, you could just print them out on 8.5″X11.5″ cardstock, cover with these handy laminating sheets (no laminating machine required) and apply the label to your storage totes. Each free printable garage bin label looks like the one below, only with different colored outlines. By the way, I’ve also included a couple of blank labels (with outlines) for you to customize. I used “Aclonica” font in case you’re interested. You can download individual files below, or scroll to the bottom of this post to download all 44 labels in one file. Click HERE to download all 44 labels (22 files) in one fell swoop!